Marie-Louise Wcislo, for the Respondent. NEAR J.:– This is an application for judicial review of the decision of the Immigration Appeal Division (IAD) of the Immigration and Refugee Board dismissing the Applicant’s appeal of a Visa Officer’s refusal to issue family class visas to the Applicant’s parents. The Medical Officer concluded that admitting the Applicant’s father would place “excessive demand” on Canada’s health and social services. The Applicant, Ashish Dhawan, is a Canadian citizen who arrived as an immigrant in 2003. In 2007 the Applicant’s mother and father (currently aged 66 and 71) applied to Citizenship and Immigration Canada (CIC) for sponsored family class visas. The Applicant’s parents underwent mandatory medical examinations in India. The examining physician, Dr. Chandra, saw the Applicant’s father on two occasions: March 8 and 15, 2008. Due to a stroke suffered by the father in 1996, Dr. Chandra found that the father experienced left-sided hemiplegia. The hemiplegia coupled with other medical issues led Dr. Chandra to predict that the father would experience increased medical difficulties in the future and that he would remain dependent on others for much of his personal care. Dr. Chandra completed an “Activity of Daily Living Form” which showed that, in Dr. Chandra’s opinion, the father currently required assistance with, or was totally dependent upon other people to carry out many daily activities. A Canadian Medical Officer, Dr. Monique-Louise LeBlanc, reviewed all of the reports of the medical examinations. She set out a detailed prognosis in a CIC “Medical Notification” form dated January 8, 2008. She concluded that the father suffers from cerebrovascular disease, a health condition that might reasonably be expected to cause an excessive demand on health and social services. She therefore found the father inadmissible under paragraph 38(1)(c) of the Immigration and Refugee Protection Act, RS 2001, c. 27 [IRPA]. By way of a fairness letter dated August 20, 2008, the Applicant’s parents were invited to comment and provide evidence in response to the Medical Officer’s report. The Applicant’s father provided CIC with a number of additional documents and reports as well as a detailed letter from a Toronto neurologist, Dr. Dimitrakoudis. The Medical Officer reviewed the additional material, but found it insufficient to alter her initial opinion. She came to the conclusion that the original medical assessment was correct. Consequently, the Visa Officer informed the Applicant’s parents by way of letter dated March 18, 2009 that they were inadmissible on health grounds. The Applicant appealed this decision to the IAD arguing that the medical opinion of Dr. Dimitrakoudis should be accepted in preference to the medical opinion of Dr. Chandra. Before the IAD the Applicant was unable to establish that the Medical Officer’s opinion was unreasonable. The IAD found that the Medical Officer gave due consideration to Dr. Dimitrakoudis’ report, and although Dr. Dimitrakoudis and the Medical Officer held divergent opinions about the father’s prognosis, there was no dispute about the basic points, which were that the father suffered a stroke in 1996 and that he continues to suffer after-effects of that stroke to date. The main contention between the report of Dr. Dimitrakoudis and the Medical Officer was regarding the father’s left-side hemiplegia. The IAD noted that Dr. Dimitrakoudis provided the caveat that he had not seen documents with respect to that aspect of the father’s condition, while the Medical Officer had the full benefit of Dr. Chandra’s report, and Dr. Chandra had the benefit of seeing the father in-person. Regarding the father’s ability to care for himself, the IAD preferred the statements of Dr. Chandra over the evidence of the Applicant and his wife. The Applicant argued that his father had a sufficient net worth to carry the financial burden of his own health and social services needs. However, the IAD found the father had not expressed this intent and, nevertheless, as per Deol v. Canada (Minister of Citizenship and Immigration), 2002 FCA 271,  1 FC 301, the IAD could not place reliance on the testimony of the Applicant as indicative of the father’s ability and willingness to pay for publicly-funded treatment and services to which he would be entitled as a permanent resident. The IAD concluded that the Visa Officer’s decision was well founded and valid in law. The IAD then went on to consider if there were sufficient humanitarian and compassionate (H&C) considerations to warrant special relief. The IAD engaged in a complete analysis. The IAD was not persuaded that the best interests of the Applicant’s dependent daughter required the presence of the Applicant’s father in Canada. The IAD was not satisfied that the Applicant had discharged his onus of showing that special relief was warranted. 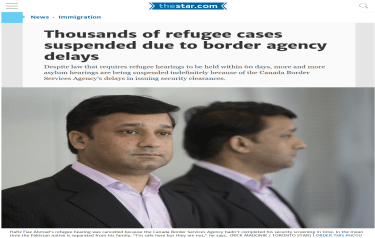 Did the IAD make capricious findings of fact in finding that Toronto neurologist Dr. Dimitrakoudis had not seen all relevant documents with respect to the patient’s alleged left-side hemiplegia while finding that the immigration physician Dr. Chandra had access to all of these documents? Did the visa post and the IAD err in law in its analysis of Dr. Dimitrakoudis’ medical opinion? Did the IAD err in its reliance on the case of Mohamed v. Canada,  3 FC 90, 68 NR 220 (FCA)? Did the visa post and the IAD make capricious findings of fact with respect to the degree of assistance that the Applicant’s father requires in daily living? Did the IAD err in law in failing to consider at all the updated report provided by Dr. Dimitrakoudis dated November 4, 2009? Did the IAD err in assuming that financial information with respect to the Applicant’s parents was not submitted to the visa post? Did the IAD err in doubting the reliance that can be placed upon financial statements from India which are handwritten? Did the IAD err in stating that there was no direct indication from the Applicant’s father of his intention to pay for any excessive demand out of his own resources? Did the IAD properly consider the Applicant’s duty to his parents in the context of Indian Hindu culture? Was the IAD’s decision dismissing the Applicant’s appeal reasonable? Did the IAD act reasonably in preferring the report of the Medical Officer over the report of Dr. Dimitrakoudis? Did the IAD misinterpret the case law? Did the Board make any capricious findings of fact? Did the Board err in its consideration of the relevance of the Applicant’s family’s financial resources? Did the IAD err in its consideration of H&C factors? (1) Emporte, sauf pour le rsident permanent, interdiction de territoire pour motifs sanitaires l’tat de sant de l’tranger constituant vraisemblablement un danger pour la sant ou la scurit publiques ou risquant d’entraîner un fardeau excessif pour les services sociaux ou de sant. The issues the Applicant raises have to do with the way evidence was weighed and assessed by the IAD. These questions are factual in nature and ought to be reviewed on the reasonableness standard (Buenavista v. Canada (Minister of Citizenship and Immigration), 2008 FC 609, 167 ACWS (3d) 781 at para 4). This Court has previously held that the decisions of a medical officer attract a standard of review of reasonableness (Mazhari v. Canada (Minister of Citizenship and Immigration), 2010 FC 467, 367 FTR 238 at para 9). Consequently, this Court should not interfere with a decision that is justified, transparent, intelligible and falls within a range of possible outcomes that are defensible in respect of the facts and law (Dunsmuir v. New Brunswick, 2008 SCC 9,  1 S.C.R. 190, at para 47). Respondent’s counsel provided Dr. Dimitrakoudis with Dr. Chandra’s letter and Report, which he had not examined as part of his initial review. In response, Dr. Dimitrakoudis supplied a revised medical opinion by way of letter dated January 6, 2011. The Respondent brings a motion seeking an order to have this letter added to the existing Certified Tribunal Record (CTR) as this third opinion letter arrived only after the deadline for the Respondent to file further affidavits. The Applicant agrees that the January 6, 2011 letter should be included in the CTR. He further submits that an e-mail from Dr. Dimitrakoudis to Applicant’s counsel dated January 4, 2011, containing what Applicant’s counsel characterizes as a clarification to the letter, should also be included in the CTR. I am of the view that the January 6, 2011 letter is helpful to the Court in that it clarifies the matter of whether Dr. Dimitrakoudis had the benefit of seeing Dr. Chandra’s reports, which is disputed in the Applicant’s written submissions. This letter acts to explain prior evidence that was put before the Board and is at issue in this judicial review. As for the e-mail thread, while it may have provided clarification for the Applicant’s counsel, it is not of great assistance to the Court. It is seemingly an attempt by Applicant’s counsel to introduce additional evidence upon judicial review that was not before the IAD. It is well-settled law that the Court may exceptionally receive additional evidence beyond that which was before the decision-maker when issues of procedural fairness or jurisdiction are raised (McFadyen v. Canada (Attorney General), 2005 FCA 360, 341 NR 345 at paras 14 and 15). The present thread does not raise these types of issues, and only attempts to put this Court in the position of re-weighing medical evidence that was before the IAD. That is not the Court’s role on judicial review, and therefore I do not see any reason to add the “clarification” that pre-dated the final opinion letter to the CTR. Surely if the clarification had been vital, Dr. Dimitrakoudis would have edited his response to Respondent’s counsel, since he initially e-mailed the Applicant with this intention. The Applicant submits that the IAD made a capricious finding of fact in determining that Dr. Dimitrakoudis was not provided with all of the relevant documents which were before the Medical Officer. Thanks to Dr. Dimitrakoudis’ letter of January 6, 2011, it is now clear that Dr. Dimitrakoudis, “did not previously receive or review a copy of the letter dated March 18, 2008 (Dr. Vijay Chandra) or the attached ADL checklist.” Dr. Dimitrakoudis indicated that “the documents are relevant in that they clearly indicate a left hemiparesis and multiple functional deficits at the time of examination in March 2008.” This is clearly not the basis for finding any reviewable error in the IAD’s decision. I have reviewed our medical file for the above-named Foreign National along with the additional material listed above it is my opinion that no information has been provided which would indicate that the original immigration medical assessment was incorrect. Therefore there is insufficient evidence to support a change or re-evaluation of the Foreign National’s medical assessment at this time. Remain M5. The IAD found it reasonable, absent evidence to the contrary, to expect that the Medical Officer would have given due consideration to the evidence. The IAD would not infer that the use of a form indicated otherwise. The Applicant submits that this is contrary to a recent IAD decision,Tong v. Canada, 2009 IADD No 797, in which the tribunal found that the medical officer was required to weigh the evidence presented to him in a meaningful way and was under a duty to show that the evidence was weighed. The Respondent submits that it was open and reasonable for the IAD to give more weight to, and prefer the medical opinion of the Medical Officer and the examining doctor over that of the evidence of Dr. Dimitrakoudis, whose opinion was not based on all of the evidence. The recent Federal Court of Appeal decision Sapru v. Canada (Minister of Citizenship and Immigration), 2011 FCA 35, 413 NR 70, is most instructive on this point. Having reviewed the respective roles of the immigration and medical officers, the Court of Appeal found that the obligation of the immigration officer to review the reasonableness of a medical officer’s opinion necessarily requires the medical officer to provide the immigration officer with sufficient information to enable this assessment to take place (see para 41). This information can be provided to the immigration officer in a number of ways – in a written report, orally (if captured in the officer’s Computer Assisted Immigration Processing System (CAIPS) notes), or a combination of the two methods. A review of the CTR shows no reference in the CAIPS notes to any communication or collaboration between the Medical Officer and the Immigration Officer. Only the generic form letter is captured indicating that the Medical Officer reviewed the submissions and came to the conclusion that her initial opinion was correct. There is nothing explaining how the Medical Officer analyzed the new information, or why it was considered insufficient to disrupt the previous finding. Her reasons are inadequate. As held by the Court of Appeal, the mere statement that the medical officer had read the fairness response is insufficient and “little weight can be given to such a generic statement that is silent about what the medical officer did…” (para 51). As such, there is no assurance that the Immigration Officer was able to assess the reasonableness of the Medical Officer’s opinion. The application of this recent jurisprudence renders the IAD’s decision that, “in the absence of evidence to the contrary, the panel finds that it [sic] reasonable to expect that the Medical Officer would have given due consideration to Dr. Dimitrakoudis’ letter”, unreasonable. For this reason, I would allow the judicial review and set aside the decision of the IAD and remit the matter to another panel. The judicial review can be disposed of on this basis alone and there is no need to address the other issues raised by the Applicant. No question was proposed for certification and none arises. In consideration of the above conclusions, this application for judicial review is allowed. THIS COURT’S JUDGMENT is that this application for judicial review is allowed.